Last Monday, we made a trip to downtown Sacramento to find an exquisite food pairing for our wines. 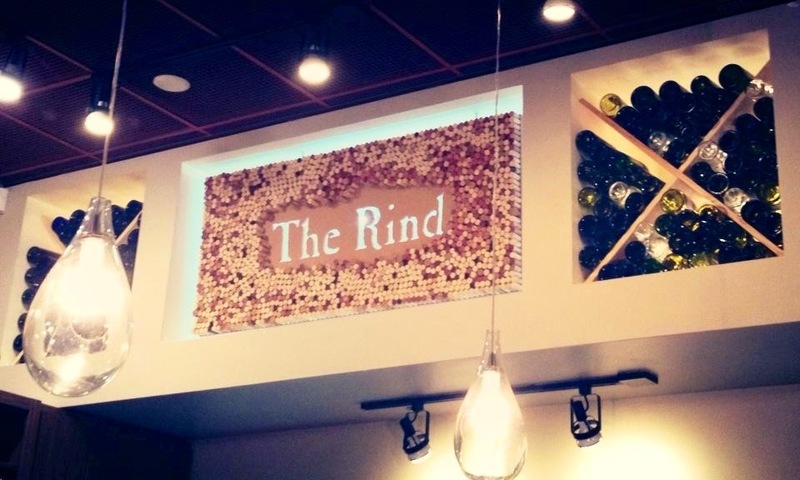 We stopped by The Rind, a local wine and cheese bar, to pair our 2011 El Dorado Reserve Syrah with a wonderful selection of cheese items handpicked by The Rind’s owner, Sara Arababian. Sara started out by pairing the Syrah with three different artisan cheeses—Humboldt Fog, Promontory Cheddar and San Joaquin Gold Cheddar. The Humboldt Fog is made by the Cypress Grove Chevre Co. in Arcata, CA, and is characterized by a tangy goat milk flavor, which Sara chose because it plays off the light fruit and more pronounced acidic qualities of the wine. Pretty good start. Next, Sara paired our wine with the Promontory Cheddar Cheese. This cheese, made by the Beehive Company in Utah, showed the Syrah’s great food-pairing qualities. The cheddar’s fruity and salty qualities emphasized the fruit in the wine, while its mellow saltiness subdued the wine’s acidity. The final cheese paired with our Syrah was the San Joaquin Gold Cheddar made by the Fiscalini Farm in Modesto, CA. This cheddar was more aged, raw and salty, qualities that accentuated the Syrah’s red fruits, while the cheese’s saltiness again subdued the acidity of the wine. All three were delicious and well-chosen pairings, as the cheese’s strong flavors complemented our Syrah’s “Old World” qualities. The best part was yet to come, however. Sara topped off the evening by cooking up The Rind’s Apple Walnut Mac dish to pair with our Syrah. The savory mac ‘n’ cheese dish is made with Beehive Cheese Company’s Apple Walnut Smoked Cheddar, which is aged for about six months and then smoked over walnut shells and red apple slices. Its cheesy flavor is augmented even more by the accompanying maple-glazed prosciutto, Granny Smith caramelized apples, and its ground walnut & breadcrumb toppings. The resulting pairing was beyond sublime and offered us a little taste of heaven. Sara found the Syrah to be unexpectedly light, which made it fun to try different, lighter cheeses to pair with it. “I originally thought I’d be pairing it with something like Pepato (a Pecorino-style cheese with whole peppercorns in it). However, after tasting the Syrah, I realized that I could take it in a different direction. This was very exciting for me because a younger and brighter cheese with a red wine is harder to do than with a older and more robust cheese,” she said. We loved the food pairings that Sara put together, as her choices produced mouthwatering combinations that truly brought forth our Syrah’s qualities. We look forward to seeing what other incredible pairings she’ll come up with for some of other wines! To try the delicious pairings featured in this post, visit The Rind at 1801 L Street, Suite 40 in Sacramento, CA. If you have a bottle of our 2011 Syrah, bring it to The Rind and enjoy it without a corkage fee. Thank you Sara! This entry was posted in Pairings. Bookmark the permalink.